Please read all of the information on this page before you make a purchase. The devices listed below are currently available for purchase directly from D*A*M. Be aware that these effects are custom built to order and will only be available for limited time periods. The current lead time and information regarding each effect can be viewed by clicking on the name of your particular device of interest. All D*A*M goods are built per customer request so a waiting period is incurred. All goods must be paid for in advance via either bank transfer, money order or Paypal. The current lead times for each pedal type is shown on the information page for that particular pedal. All questions and/or requests regarding colour schemes, circuit tailoring and modifications must be made before you make payment. Once your payment is received order processing begins and radical changes cannot be made. 1) Add the item/s you wish to purchase to your shopping cart using the 'Add to Cart' buttons shown above. 2) Once you have made your selection you must then add the shipping costs to your shopping cart manually yourself. 3) To do this select your destination from the two from drop-down boxes shown above then add that selection to your cart. You only need to add this once per order and not per item. 4) Failure to add shipping to your shopping cart will delay the processing of your order. If you wish to order goods directly from D*A*M and prefer to pay via bank transfer, cheque, or money order please use the email contact button to your left. You will need to supply your full name, shipping address and a telephone number for an invoice to be issued. All prices listed are shown in UK pounds sterling and do not include VAT or shipping costs. All UK and EU orders are subject to 20% VAT which will automatically be added upon check out. Shipping costs are charged based on destination. 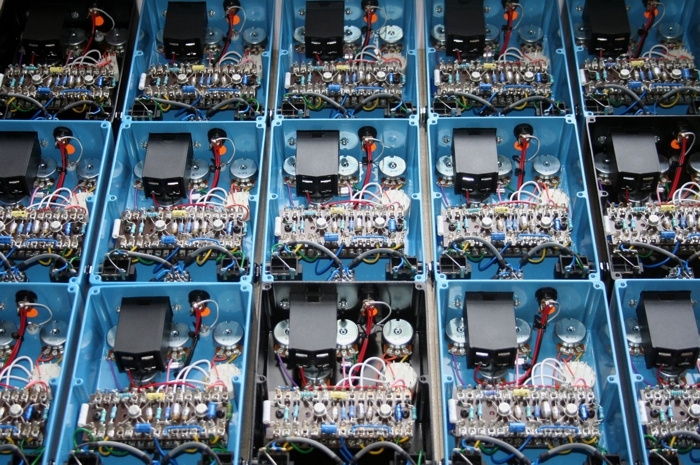 Due to the bespoke nature of D*A*M effects we only carry a small number of active enclosure stock at any one time (i.e. enclosures that are screen printed and machined ready for final assembly) The standard size per batch is on average 10-12 pieces. Once the current batch is exhausted for a particular pedal the status will be shown as sold out and that item will not be available for purchase. These items will be available to order again once we have restocked on enclosures. The one-off and small run custom project facility is currently closed until [time frame unknown]. Examples of past work can be viewed here. Be aware that this type of build process is highly labour intensive and any work that is commissioned is priced accordingly.